The words of others speak higher than my own. 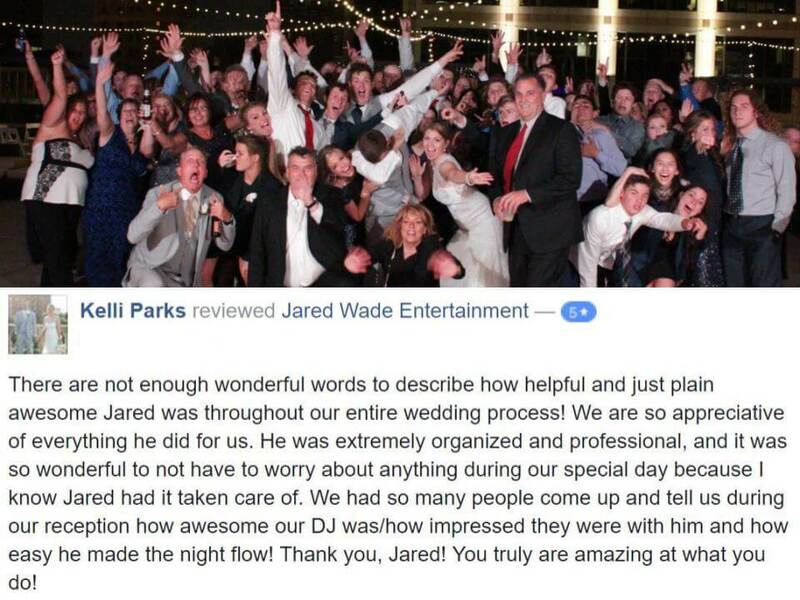 Feel free to read what others have to say about my Master of Ceremonies and Wedding DJ aptitude. Complete and Total Access to ME | This is part of ALL my DJ services | Yes that's right! You will be able to call, text, email, Skype, or even snail mail directly with me! One of the largest factors that Brides choose me over others is that you are able to communicate and plan directly with me, vs an office staff or some middle person. This is largely due to the fact that those other DJs don't Entertain/Host/DJ full time, 365 days a year. I do. I am available as often as possible, emails go directly to me, calls go directly to me. I make it my goal to be available for you as much as possible. A Complete Online Planning Suite | This is part of ALL my DJ services | This allows you to work on music, order of events and anything else when YOU want to. I will always be here to help and assist, and you will always be able to call or text me directly. However, you will always have the ability to work on your must play music list, or Bridal Party Intros when you are able to, Day or Night, Weekday or Weekend. Interactive Elements, Custom Introductions & More | This is part of ALL my DJ services | Having things happen during the Reception is becoming more and more popular. This doesn't mean taking the attention or focus off the main reason we are there be it a Bride & Groom or any other VIP. What this means is creating a unique and creative atmosphere that your friends and families can have fun in, without the event becoming too stale or rigid. If you wish, I will work with you to come up with some creative ideas that we can apply to your Wedding. The sky is the limit! A Complete Reception System with Lights | This is part of ALL my DJ services | Appropriate for the venue size and guest count - Bigger doesn't always equal Better. The equipment that I use is all name brand, completely insured, high quality that I take care of on a weekly basis. The Reception System includes 1 Wireless microphone for speeches and toasts, a sound PA system that will create an amazing party atmosphere without causing people to leave due to volume, an LED Dance Floor light show that will wash the dance area with colors all night long, cabling, mixer and controllers to make sure I can control everything properly. See if Jared is still available!